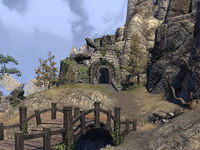 Old Kalgon's Keep is a ruined keep in Rivenspire. A necromancer named Louna Darkblood and her sisters Calixte and Lyse reside here. Kill the necromancer, Louna Darkblood, at Old Kalgon's Keep.